A funny math lesson, thinked for children, but with a lot of interessant topics for adults too. 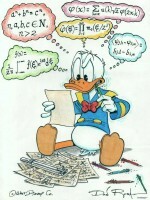 Popular educative Disney film that introduces the world of Mathematics and Geometry. Math games... and not only. The video presents shortly the national robotics pupils' contest, whose finals took place in Athens. The contest relates to the development and presentation of pupils’ projects that combine robotics, mathematics, mechanical engineering and technology. Easy Maths for all ages! The italian web platform REDOOC is providing an easy way to approach to all mathematics difficulties through small videos and examples. Test and games are included. The idea is that nobody is not able to be applied to STEM issues, it is matter to find the right apprenticeship style. In this contribution we present some questions that you can use to know the knowledges of the guys that start a technical high school. Some questions are very easy, others difficult. We would like know, with this questions, the ability of reasoning of our guys.